*Corresponding Author: Rania M Fahmy, Department of Ophthalmology, Faculty of Medicine, Cairo University, Egypt. Introduction: Xeroderma pigmentosum (XP) is a very rare skin disorder where a person is highly sensitive to sunlight, has premature skin aging and is prone to developing skin cancers. This is caused by a cellular hypersensitivity to ultraviolet (UV) light as a result of a defect in the DNA repair system, and is reported to be associated with ocular surface disorders such as conjunctival malignancy and pterygium. In this study, I report a case of successful Amniotic Membrane Graft (AMG) in a XP patient after surgical resection of pterygium. Case: 15 years old girl, who is suffering from XP, presented to our clinic for treatment of her bilateral pterygium. 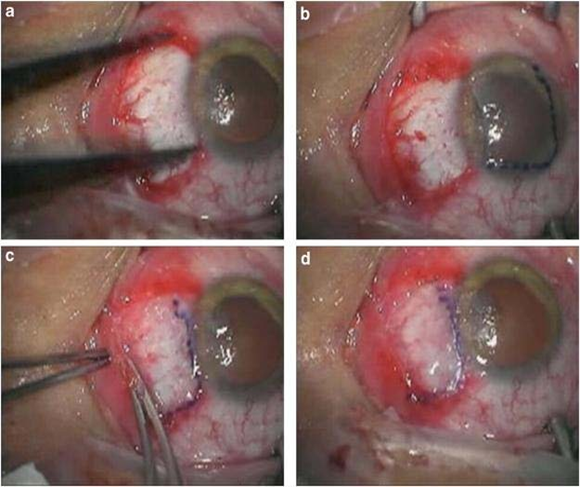 Surgical resection was performed for a nasal, rapidly progressive pterygium in her left eye associated with multi-layer amniotic membrane grafting. Examination: Re-epithelialization over the AMG was completed after 14 days. Best corrected visual acuity was improved after two months post operatively. No recurrence was noticed during one year of regular follow up. Conclusions: AMG as an adjuvant to primary pterygium resection is effective in patient with XP. Further more, multi-layer AMG is beneficial in protecting bare sclera and medial rectus muscle from mechanical injury after pterygium resection. Xeroderma pigmentosum (XP) is a rare, autosomal recessive, precancerous skin disorder, and is characterized by cellular hypersensitivity to ultraviolet light as a result of defect in DNA repair system . XP is proved to be linked to ocular surface disorders such as conjunctival tumors and pterygium . Amniotic Membrane Graft (AMG) is validated to be useful in reconstructing many ocular surface disorders, including pterygium [3-5]. In our study, we report a case of successful surgical treatment of pterygium with multi-layer AMG in a XP patient. 15 years old girl diagnosed with XP was presented to our clinic for treatment of her bilateral pterygium. Family history of XP was negative. Surgery was performed under general anesthesia for a rapidly progressive pterygium that was encroshing over the cornea of the left eye. The pterygium and underlying fibrous tissue were excised thoroughly, and abnormal scar tissue on the corneal surface was polished. Minimal cauterisation was used to control the bleeding. The size of the bare scleral bed (in mm 2) was measured in the position that the eye deviated away from the side of the lesion in order to have a maximum area of defect. Amniotic membrane was taken out of the preservation medium, marked with gentian violet, and cut to the proper size to cover the defect area. A total of three layers of AMG (multi-layer AMG) were used. The membrane was placed over the cornea with the epithelial/basement membrane surface on top. After the bare scleral area was dried with a cellulose sponge, fibrin glue was applied onto scleral surface and spread with the cannula. The membrane was transferred immediately over the scleral bed and fixated by pinching the edges of the membrane together with the surrounding conjunctiva. Also, the fibrin glue underneath the graft was spread with a muscle hook and excess glue was trimmed using Westcott scissors. The stability of the membrane was checked with a cellulose sponge, and additional glue was applied if necessary (Figure 1). Figure 1: Surgical procedures of multi-layer Amniotic Membrane Graft (AMG). (a) The bare scleral defect was measured with caliper after the excision of the pterygium. (b) Amniotic membrane was marked with gentian violet to ensure that a proper-sized graft, which would cover the defect area, was obtained. The membrane was placed over the cornea with the epithelial/ basement membrane side on top. (c) The membrane was slid over the scleral bed and the edges were ‘pinched’ together with the recipient conjunctiva using a smooth forceps. (d) The stability of the membrane was checked with a cellulose sponge. After surgery, biomicroscopic examination was performed on the first day, and topical antibiotic (ofloxacin 0.3%; Allergan Pharmaceuticals, Dublin, Ireland) and steroid (dexamethasone 0.1%; Alcon, Fort Worth, TX, USA) drops were given four times daily. Patient was examined weekly and the medications were tapered and discontinued until the end of the first month. Patient was required to wear a protective eye shield for 14 days after surgery. The patient was followed up monthly for the first 6 months and at 3- months intervals. Re-epithelialization over the AMG was completed after 14 days. Corrected visual acuity improved after two months post operatively. During the first year regular follow-up, neither recurrence nor any post operative complication, such as graft rejection, symblepharon, or chronic inflammation, was observed. The primary goal in pterygium surgery is to remove the fibrovascular growth that will eventually result in permanent fibrosis in the pupillary axis and to reduce recurrence. Moreover, the surgeon should aim to reduce resection-related complications, increase patient comfort in the post-operative period, and accomplish a justifiable appearance. Although, the diverse modes used in the management of pterygium have concentrated principally on minimizing the recurrence rate. Among the efforts to improve efficiency of pterygium surgery, glue graft fixation procedures that aimed to avoid inflammatory suture-related complications, such as granuloma, abscesses, and giant papillary conjunctivitis, have been recently familiarized. AMG has recently been used as a complement to pterygium surgery for arresting recurrence and for covering large conjunctival defects . Ma., et al. recently reported that AMG alone attains a lower recurrence rate of 3.8%, as compared to 5.4% for conjunctival auto graft in primary pterygium surgery. Moreover the recurrence rate of pterygium in an XP patient has not been reported yet, the pterygium in this case was considered as highly assertive regarding the youth of the patient and that 40% of XP patients are reported to have bilateral pterygia . Based on the data of Maetal  and the fact that the pterygium in this patient was large, we performed AMG. The present case advocate that multilayer AMG is efficient for pterygium, even in a young XP patient where pterygium is supposedly highly active and easy to recur. Also, the multi-layer AMG appears to be beneficial compared to the single-layer method to nullify melting caused by severe inflammation and to shelter bare sclera and muscle especially when the patient’s compliance is not enough. The use of fibrin glue was safe and effective with no major complications. Further comparative study between single and multi-layer AMG is recommended to certify the clinical value of this modality of AMG. Goyal JL, Rao VA, Srinivasan R, Agrawal K. (1994). Oculocutaneous manifestations in xeroderma pigmentosa. Br J Ophthalmol 78(4): 295-297. Ang LP, Chua JL, Tan DT. (2007). Current concepts and techniques in pterygium treatment. Curr Opin Ophthalmol 18(4): 308-313. Gomes JA, Romano A, Santos MS, Dua HS. (2005). Amniotic membrane use in ophthalmology. Curr Opin Ophthalmol 16(4): 233-240. Solomon A, Pires RTF, Tseng SCG. (2001). Amniotic membrane transplantation after extensive removal of primary and recurrent pterygia. Ophthalmology 108(3): 449–460. Ma DH, See LC, Liau SB, Tsai RJ. (2000). Amniotic membrane graft for primary pterygium: comparison with conjunctival autograft and topical mitomycin C treatment. Br J Ophthalmol 84(9): 973-978. Citation: Rania M Fahmy. (2019). Amniotic Membrane Grafting in a Patient with Xeroderma Pigmentosum following Pterygium Resection. Journal of Ophthalmology and Vision Research 1(1). Copyright: © 2019 Rania M Fahmy. This is an open-access article distributed under the terms of the Creative Commons Attribution License, which permits unrestricted use, distribution, and reproduction in any medium, provided the original author and source are credited.